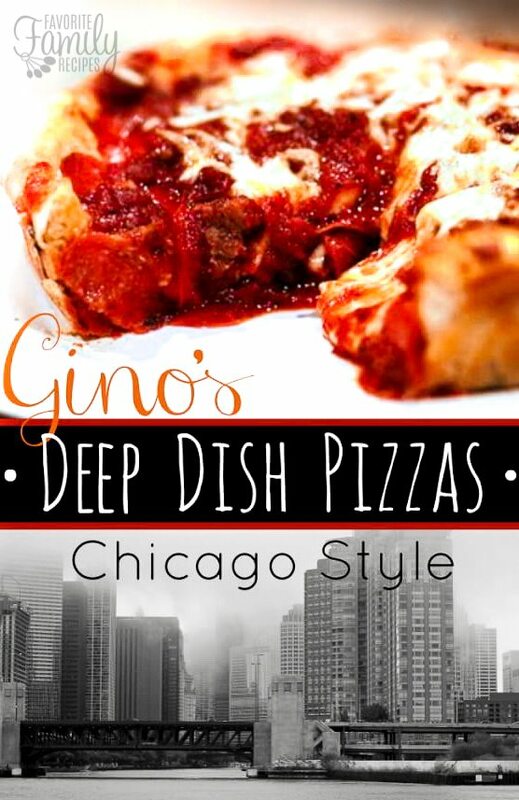 This Gino’s Deep Dish Chicago Style Pizza Copycat is so incredibly good. It’s loaded with melty cheese on bottom, then topped with meat and marinara sauce. I found several recipes for Gino’s Deep Dish Chicago Style Pizza online but none of them were quite right. I decided to combine them and do some other modifications of my own to create my own version. We watched a big special about it years ago on the Travel Channel, and couldn’t wait to try it on my trip to Chicago. I had a few things on my Chicago to do list, but going to Gino’s (along with seeing the giant bean and taking an architecture tour by boat- I took the skyline pic at the bottom of the picture above on the tour) was right at the top! I have to admit, our version is VERY close to the original! I LOOVVVE this pizza! It’s so fun that the cheese is on the bottom and the sauce is on the top. Probably some of the best home-made pizza I have ever had. YUM! Try it and let me know what you think! **I added a little cheese to the top about 1/2 way through baking so it would look better for the picture. This is completely optional. I know it's not the "real" way they do it, but it's the way I did it. In a bowl, put water (luke warm), then yeast, oil, cream of tartar, and sugar. Mix with hand until yeast dissolves. Then, pour in Bread Flour a little at a time. Mix with your hand. Just curve your hand like a dough hook and hold the bowl and mix. Then, knead it until it gets firm. Add more flour if needed. The secret is the kneading. Knead it for about 10 minutes straight. Then, roll it into a ball, and put it in a bowl with oil brushed in the sides. Cover with plastic wrap and a kitchen towel. Let sit overnight unrefrigerated. Only let it rise once. Portion and use. Take the tomatoes and sauce and place into a bowl. Using a potato masher or just your hands, mash the tomatoes up so that there are no chunks bigger around than a quarter. Once this is done, add the rest of the ingredients and stir. Adjust the salt and pepper to taste. Do not use too much basil or oregano. Preheat oven to 350. After the dough has risen take your deep dish pizza pan (or a round cake pan with straight sides) and coat the inside of it with a very healthy coating of melted butter or oil. Roll the dough out to about 3 inches larger than the bottom of the pan and pinch the dough up along the sides of the pan. Now put your cheese in (right on the crust). Then add your pepperoni and sausage pieces, and finally your sauce (Don't worry, the sausage will cook through completely in the oven). Bake in the oven until the crust is starting to brown and cheese is starting to bubble up through the sauce. The little edges of the pepperoni should also be starting to crisp and the sausage should be cooked through (about 45 minutes). Gino's pizza was the first deep dish pizza I had — it's great. And while i like others (Uno's. Lou Malnati's), Gino's has a special place in my heart (and stomach!). When my kids go to Chicago I have them bring me a pizza back from Gino's. I've found that it's equally as good warmed up the next day. I made this for my family last week and it has become our favorite homemade pizza BY FAR! Thank you for sharing! this may be a stupid question but after you let the dough raise overnight, do you leave it out until you use it for dinner that evening? Or, do you refrigerate it until you use it for dinner? Sorry, I was confused on this part. I am new to pizza dough making. You can refrigerate it but take it out an hour or so before you start making it. Or you can make the dough in the morning and let it rise until you use it that night. Hope this helps! No Cornmeal? The Ginos I went to on Rush was better than Ginos East, I think. Can’t find any quite like it, but I think I’ll try your recipe! Thanks! We have never been to the Ginos on Rush. What do you like better about it? Living in Mexico I’ve had to learn to make many things from scratch that I miss from the good ol’ USA! Originally from the Chicago area, this pizza is one of the things I miss most. This recipe is almost exactly how I make it. The sauce may sound too simple and the temptation will be to jazz it up or even use a store bought variety. But trust me you do not want to do that. Follow the recipe above and you will have an authentic tasting Chicago-style deep dish pizza. Except of course (as you state), the cheese on top. You would do better to dust it with some ground Parmesan. All in all a very good recipe! Oh, remember, as with any recipe, make sure you use good quality ingredients, especially the cheese! Thank you so much for the great comment! I definitely want to try it by just dusting on some Parmesan! Thanks for the tips, it’s good to hear from a true Chicago local! Thank you so much for this review Allison!!! After reading it I decided I need to make this again! I’m definitely craving it and I know I won’t get any complaints from my husband. I am so glad your family liked it! Thanks for taking the time to write such a nice comment! Yep. My crust recipe is exactly the same. I always use whole-milk mozzarella, and never part-skim, since it melts better and a little more flavorful. I’m also fussy about the tomatoes – look for “San Marzano type” whole 28-oz can. There are several brands, and this type is sweeter and more flavorful. Cost me $3 – 4 for imported, but worth it to me. I don’t add any salt or oregano to them. going to try my 1st Chicago deep dish, being from there I love Gino’s east & Lou Malanatis. I’m looking to make a 16″ pie does anyone have the recipe for that sixe? I am going to make this soon, but I can’t find what size of pan you suggest, is a 9″ cake pan what you are referring to or something larger? Where can you buy a deep dish pizza pan? Any websites? How wide and deep are they traditionally? I’m gonna make this with store-bought pizza dough and save time. Chefs Catalogue. They have a great selection and superb service. Walmart may have a cheap one. You can use a cast iron skillet as well. I bought my 14″ deep dish pan at a local outlet mall in the kitchen store. But, I have used a 14″ cast iron skillet to good effect as well. I do like a little sugar in the sauce though to cut the tartness of the San Marzanos. How big of a pizza does this make? We have 5 in our family. This was about 5″ in diameter.. (so 10″ across). It could feed about 4-5. Diameter is a straight line going through the center of a circle connecting two points on the circumference. If the pizza in question is 10” across, then it is 10″ in diameter, with 5″ being the radius. I have a 14″ pizza pan is the dough sufficient? Should I turn heat down if making in cast iron skillet? Do you use all the dough made?? Or just some? I use all of the dough. Thanks for asking! Would it ruin the pizza to put the sauce on first then the cheese? You can do it that way but that isn’t traditionally how Gino’d does it. I am giving it a try. Dusting the crust with cornmeal is one of Gino’s trademarks. Not sure if you can help. I have tried this and though the taste is great it is too “liquidy”. Any suggestions? Hmmm, that is interesting. I can’t say we have had that problem before. What kind of pizza sauce are you using? This is a great recipe. I made this but cooked it on my Kamato ceramic grill. It turned out amazing. Oh yum! That sounds delicious! Thanks for sharing your cooking method. I will definitely have to check that out! This pizza recipe is so good and so easy and really hits the spot for us missing Chicago style pizza. I followed the directions except used a 9×12 cake pan because I didn’t have a pizza pan. It worked well. We are vegetarian so left the meat out and added spinach, garlic and pineapple and it was fabulous! So glad I found this recipe! Thanks!! Yay! I am so glad you liked it and were able to tweak it to be what you needed. Thanks for the 5-star rating! Why cream of tartar ? It gives the crust more of a smooth taste and consistency. Hope this helps!